Hearing: Anatomy, Physiology and Disorders of the Auditory System provides detailed information about the anatomy and physiology of the entire auditory system and it describes important aspects of disorders of the middle ear, the cochlea, and the nervous system in a comprehensive manner. Most other textbooks on Hearing are focused on either the periphery or the central nervous system and rarely integrate anatomy and physiology with clinical issues. In the past years, it has become apparent that pathologies of the peripheral parts of the auditory system affect the function of the nervous system, and vice versa. It is thus more and more important to view the peripheral and central parts of the auditory system in an integrative way. This book integrates descriptions of disorders of the ear and the nervous system and provides a comprehensive coverage of anatomy and physiology of the entire auditory system. The book introduces the role of neural plasticity in the symptoms of disorders such as tinnitus, hyperacusis and phonophobia. A separate chapter discusses cochlear and auditory brainstem implants. Neuroscientists, neurologists, audiologists, otologists, neurotologists, basic and clinical researchers in the auditory field. SECTION I: THE EAR. Chapter 1: Anatomy of the ear. Chapter 2: Sound conduction to the cochlea. Chapter 3: Physiology of the cochlea. Chapter 4: Sound evoked electrical potentials in the cochlea. References. SECTION II: THE AUDITORY NERVOUS SYSTEM. Introduction. Chapter 5: Anatomy of the auditory nervous system. Chapter 6: Physiology of the auditory nervous system. Chapter 7: Evoked potentials. Chapter 8: The acoustic middle ear reflex. SECTION III: DISORDERS OF THE AUDITORY SYSTEM. Introduction. Chapter 9: Hearing impairment. Chapter 10: Hyperactive disorders of the auditory system. Chapter 11: Cochlear and brainstem implants. APPENDIX A: Definitions in anatomy. APPENDIX B: Hearing conservation programs. Dr. Møller is currently the M.F. Jonsson Professor of Hearing, University of Texas at Dallas, the Callier Center for Communication Disorders. He was on the faculty of the University of Pittsburgh School of Medicine for 19 years, where he held positions as Research Professor of Otolaryngology and later of Neurological Surgery. From 1988 to 1997 he held the position of Professor of Neurological Surgery. He received his medical education at the Karolinska Institutet in Stockholm, Sweden, where he also held faculty positions for more than 10 years. Dr. Møller is founder and Editor-in-Chief of the international journal Hearing Research. 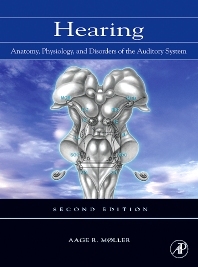 In Hearing: Anatomy, Physiology, and Disorders of the Auditory System (Second Edition), Aage R. Møller aims to educate those who will be researching and diagnosing hearing disorders, as well as provide a general understanding of how this complex system works. The book offers an excellent foundation of anatomy and physiology of the system, and goes into great detail on disorders and diagnostic procedures. --Wafaa A. Kaf, M.D., PhD, CCC-A, Assistant Professor Missouri State University Communication Sciences & Disorders, Springfield, MO, BOOK REVIEWS AMERICAN ACADEMY OF AUDIOLOGY website. Rating: 4 out of 5 ears.